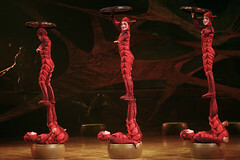 The name for the new Cirque du Soleil touring show that will premiere on April 23, 2009 in Montreal, Canada was unveiled. The name is: ???OVO???. The Cirque?? ?s web site was also updated (it used to show simply ?? ?Cirque 2009?? ?, which was the working title of the show). There are not much video images of the show available. The official trailer for the show is a just 16 seconds in length with less than half of that being images from the show itself. Download this video in AVI format from my Mediafire.com account. There are a few more photographs though, which I made available on my Flickr.com account. I created a new set for the ???Ovo??? show under my existing Cirque du Soleil photo collection. This is Cirque?? ?s 25th show production in 25 years. Yes, 2009 also marks the 25th anniversary of the Cirque. Congratulations. They were busy over the past few years. More than half of their 25 shows were created within the past 10 years. Last year 3 shows were launched in a single year in 3 different countries on 2 continents. What is interesting about OVO is the fact that almost every important person among the creators of the show didn?? ?t play a major role in the creation of any of the previous Cirque productions. Except from the usual mention of Guy among the creators of every Cirque du Soleil show, Jonathan Deans who did the Sound Design for Ovo, is the only person who worked on other shows. Jonathan did the sound design for the Cirque du Soleil touring shows Saltimbanco and Kooza and helped with the lighting design for Corteo. Deborah Colker wrote and directed the new show and also did the choreography. Director of Creation is Chantal Tremblay, who is not exactly a newbie to Cirque du Soleil. She was Associate Producer for the resident show ?? ?The Beatles LOVE??? at the Mirage hotel and casino in Las Vegas, Nevada. She actually started out as a dancer in Cirque, then became an assistant to choreographer Debra Brown, then Artistic Coordinator and then Artistic Director. The composer of the music for the show is Berna Ceppas. The music by the early Cirque shows was composed Ren?? Dup??r? ?, Beno? ?t Jutras and then later also by Violaine Corradi. That changed over the past years and many new composers were introduced to the Cirque family, including: Jean-Fran? ?ois C??t?? (Kooza), Philippe Leduc (Corteo), Simon Carpentier (Zumanity), ? ?ric Serra (Believe). Ren?? Dup??r?? was busy with the music for Zed and Violaine Corradi for the show Zaia. I don?? ?t know what happened to to Beno? ?t Jutras. Maybe he is busy with one of the other Cirque projects that are currently in production. I am not familiar with Berna Ceppas and his music. I know that he is from Brazil and learned that he has a MySpace page where you can listen to some of his earlier work to get an idea about how the music for Ovo might sound like. The short trailer was unfortunately not long enough to get it from there. Additional show credits: Set Design and Props: Gringo Cardia, Costume Design: Liz Vandal, Lighting Design: ? ?ric Champoux, Make up: Julie B? ?gin, Rigging: Fred G? ?rard, Acrobatics Act Designer: Philippe Aubertin, Artistic Guides: Gilles Ste-Croix & Guy Lalibert??. Cirque du Soleil also launched a Facebook page for Ovo. Another YouTube user from Germany with I am in touch will be in Montreal for the premiere. I won?? ?t be able to make it myself, but he promised me to let me know about his impressions from the show. Like the previous touring shows of Cirque du Soleil, Ovo will start its multiple years long journey across Canada, the United States and then the rest of the world, including Europe, Asia, Australia and South America. I hope to have some new video material from the show available soon to post it on my YouTube channel and share it with you. 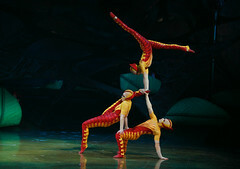 I have already over 350 videos about Cirque du Soleil and related subjects up online. You might want to check it out. Also do not forget my Cirque du Soleil Primer article for facts and information about your favorite Circus, the Cirque du Soleil.